On January 12, 2010, an earthquake struck the Caribbean nation of Haiti. More than 100,000 people died and even more were left homeless. Houses and other buildings crumbled to the ground when an earthquake struck Haiti in January 2010. As many as 1.6 million people were forced to live in sprawling tent cities like this one. On January 12, 2010, an earthquake struck near the town of Legoane, Haiti. The earthquake devastated the tiny Caribbean nation, causing more than 100,000 deaths and displacing a million people. Poor infrastructure is sometimes blamed for the catastrophic impact. Thousands were killed when buildings in the Haitian capital of Port-au-Prince collapsed. A small, localized tsunami also tore through many buildings on the coast. 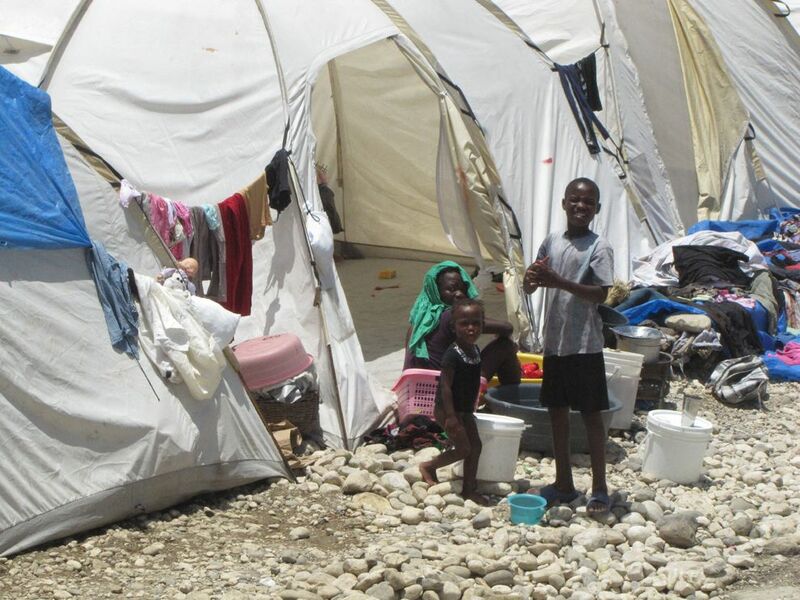 Years later, thousands of Haitians remain homeless, living in “tent cities” in Port-au-Prince. The Haitian government, the World Bank, and many international organizations are working to help these internally displaced persons access clean water, food, schools, and employment. someone forced to leave their local area, who has not left the country. United Nations organization that loans money to poor and developing nations.